Location! Location! Location! 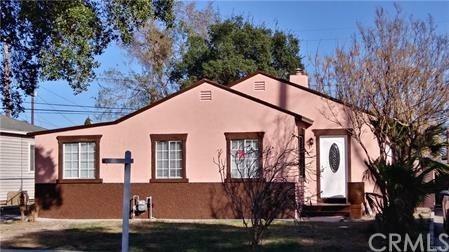 Great Looking Property in the city of Fontana. 1 Block and a half from City Hall, Police Department & Libary. 1 Block from Sierra Ave from Fontana Metro Link, Close to Fontana Middle School, Elementary school, Service Park and Amphitheatre, Shopping and much more! Remolded Completely; Brand New Floors, Windows, Fixtures, Pains Inside and Outside Patio, Private Backyard. 3 Bedrooms, 1 bath plus a bonus room detached with permits (246 sf.) that can easily be use generate additional income. Total living area 1,023 sf, year built 1942, lot size 6396 sf. Features include an open floor plan with a bright atmosphere, New wood & tile floors throughout. New exterior and interior paint, new dual paneled windows & new cabinets, new quartz countertops, new sink, and faucet. bath offers new sink, cabinet, faucet, fixture, toilets and Newly refurbished tub. 2 car garage with bonus room and Private yard.